I walked into this store called Maxway here in the nation’s Capitol and this dress and I met eyes. To make things awesome the dress only cost $7.99, yes I typed this correctly, $7.99. What is a girl to do…ugh? I picked this zebra up and ran to the cashier. The cashier was shock when she saw the price too. I kindly smiled, swiped, and walked out the store with glee. 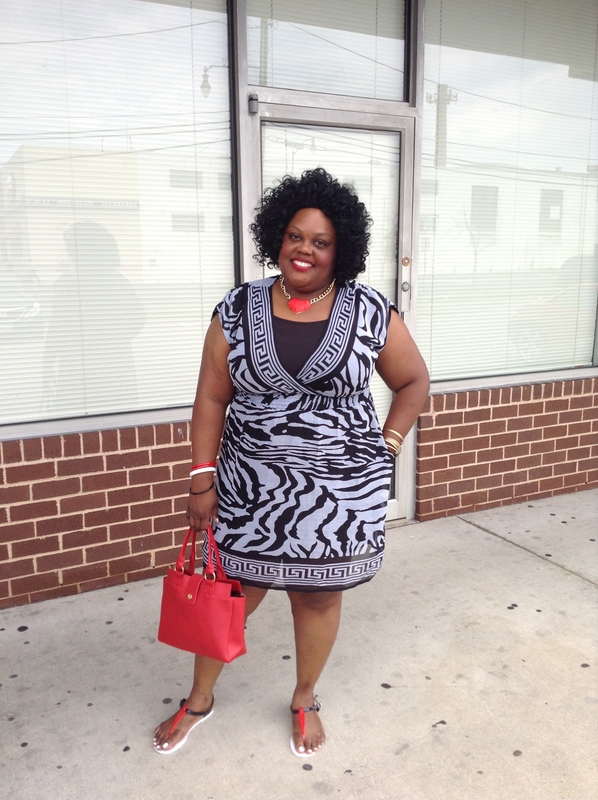 This black and gray, zebra print is an easy dress to put on. I wore a black, cotton cameo to hide the twins. I added a heart crimson and gold necklace, red studs, and few bangles just adding a little life to the dress. The dress is an easy wear for the beach. The open deep plunge in the front of the dress will make any bathing suit pop. Its is light and really don’t require to much attention too. Curves do not need to spend a lot to look GREAT! Curves make the clothes, if dazzled correctly! Check you out ! I love this look!